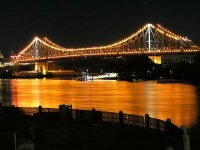 One of the oldest bridges in Australia, the Story Bridge is a 3,517-foot (1,072m) long cantilevered bridge which spans the Brisbane River, connecting Fortitude Valley to Kangaroo Point. Brave visitors who are certain they don't suffer from vertigo can climb to the top of the bridge and be rewarded with breathtaking views over Brisbane's cityscape. One of only a handful of bridge climbs in the world, the Story Bridge is well worth a visit for those travelling through Brisbane. Advance bookings are recommended and money can sometimes be saved by booking online. Special deals are available for groups and there is even an abseiling option. Check out the official website listed below for more details.